Lupin anthracnose is a serious disease of all species of lupins, but is more likely to severely damage albus lupins. Anthracnose causes bending and twisting of stems, with dark brown lesions in the crook of the bend. The lesions cause the stems and lateral branches to weaken and collapse. It’s found in Western Australia and South Australia. 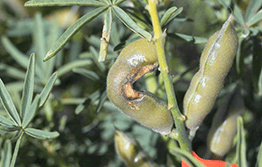 If you see signs of lupin anthracnose on plants anywhere else in Australia, call 1800 084 881. Anthracnose is spread by the movement and planting of infected seed. It is more likely to spread in high-rainfall areas with warmer temperatures. In October 2016 lupin anthracnose was detected for the first time commercial crops in south eastern NSW. Natural hosts of lupin anthracnose are not established in NSW and as the known infected crops are relatively isolated, successful eradication of the disease may be possible. Lupin anthracnose is a notifiable plant pest in NSW. Suspect symptoms must be reported to NSW DPI on 1800 084 881.